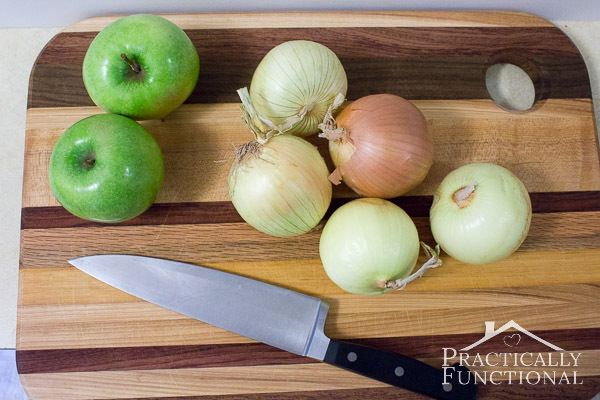 I absolutely love French onion soup, so when I found this apple French onion soup recipe, I knew I had to try it! 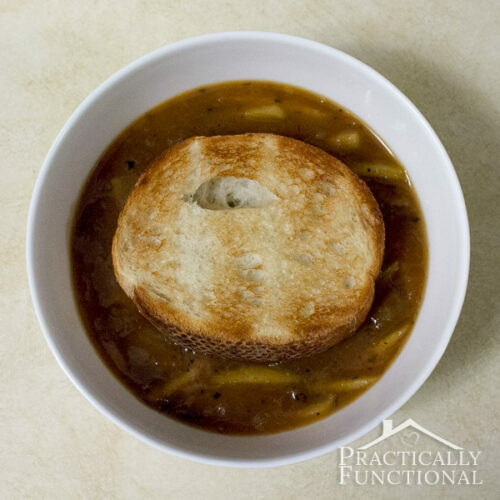 Turns out it’s absolutely delicious; apples and apple cider are the perfect addition for a fall version of a classic French onion soup! 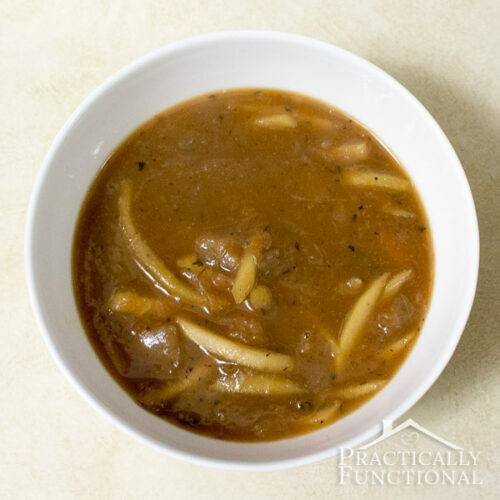 The apples and cider make this soup sweeter than regular French onion soup, but it’s still thick, hearty, delicious, and perfect for fall! 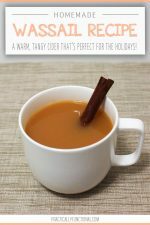 NOTE: If you want a sweeter soup, use sweet white wine and apple cider; if you want something a little less sweet, use a dry white wine and use unsweetened apple juice instead of the cider. Start by chopping the onions into small pieces. Melt the butter in a large soup pot, large enough to hold all of the soup. Once the butter is melted, add the sliced onions and the water and cover. Cook the onions on medium heat until they are tender, caramelized, and golden. This part takes a while (about 2 hours), but you only need to check the onions every 20-30 minutes to make sure they aren’t burning. If needed, add a bit more water as the onions cook. I find I usually add 1/4 C to 1/2 C every half hour or so before the onions were fully cooked. You don’t want them swimming in water, but you don’t want them burning either. While the onions cook, peel and julienne the apples. Once the onions are cooked, stir in the sliced apples and the thyme. Stir the soup for a few minutes as it continues to cook. Then slowly mix in the flour and stir for another few minutes. 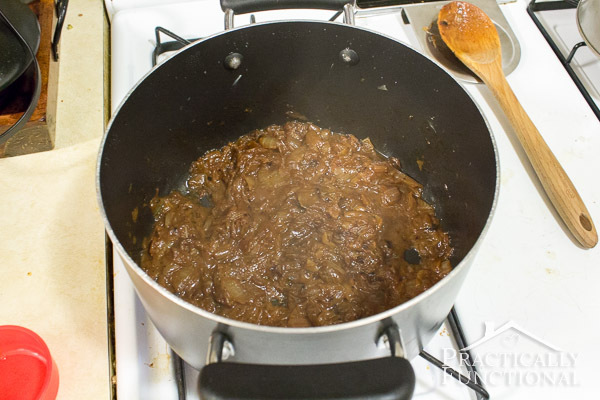 Then add the wine and stir to deglaze the pan; the wine should pick up all the brown bits of onion stuck to the bottom of the pan. Once the pan is deglazed, add the cider, beef broth, and bay leaves. Bring the soup to a boil, then reduce heat and simmer for 30 minutes. While the soup cooks, grate the cheese and cut the bread into thick slices. Lightly toast each slice in a toaster. After 30 minutes, add a splash of brandy to the soup and then salt and pepper to taste. 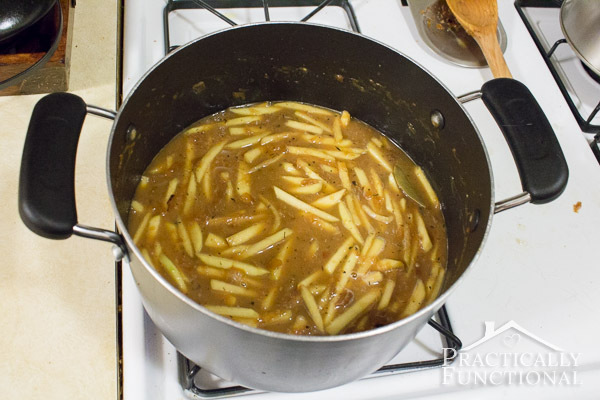 This part is pretty important because it will help balance out the sweetness of the apples and cider. Ladle out the soup into oven-safe bowls. Top each bowl with a piece of toast. 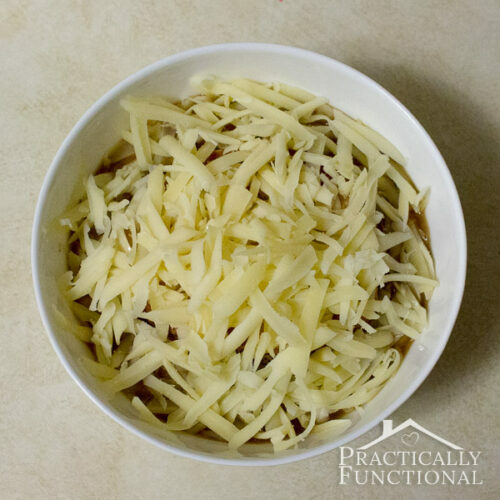 Sprinkle grated cheese over the whole bowl of soup, making sure it covers the bread and the surface of the soup. Turn on your broiler and put the bowls in the broiler until the cheese bubbles and turns slightly brown, about 2 to 3 minutes. Be careful when pulling the bowls out of the broiler, they will be way too hot to touch for about 10 to 15 minutes. Add a spoon, and enjoy! 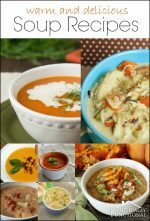 What is your favorite fall soup? I really like my Kabocha curry squash soup and curried cream of chicken soup, but I still think this one is my absolute favorite! The apples and cider make this soup sweeter than regular French onion soup, but it's still thick, hearty, delicious, and perfect for fall! Once the butter is melted, add the sliced onions and the water and cover. Cook the onions on a medium heat until they are tender, caramelized, and golden. (This part takes a while, about 2 hours). If needed, add a bit more water as the onions cook to keep them from sticking to the pan. Once the onions are cooked, stir in the sliced apples and the thyme. Stir the soup for a few minutes as it continues to cook. Then slowly mix in the flour and stir for another few minutes. Then add the wine and stir to deglaze the pan. Once the pan is deglazed, add the cider, beef broth, and bay leaves. Bring the soup to a boil, then reduce the heat and simmer for 30 minutes. While the soup cooks, grate the cheese and cut the bread into thick slices. Toast each slice slightly in a toaster. Turn on your broiler and put the bowls in the broiler until the cheese bubbles and turns slightly brown, about 2 to 3 minutes. Be careful when pulling the bowls out of the broiler, they will be way too hot to touch for about 10-15 minutes. If you want a sweeter soup, use sweet white wine and apple cider; if you want something a little less sweet, use a dry white wine and use unsweetened apple juice instead of the cider. 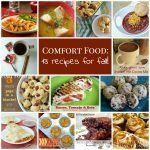 13 Comfort Food Recipes For Fall! This looks wonderful! 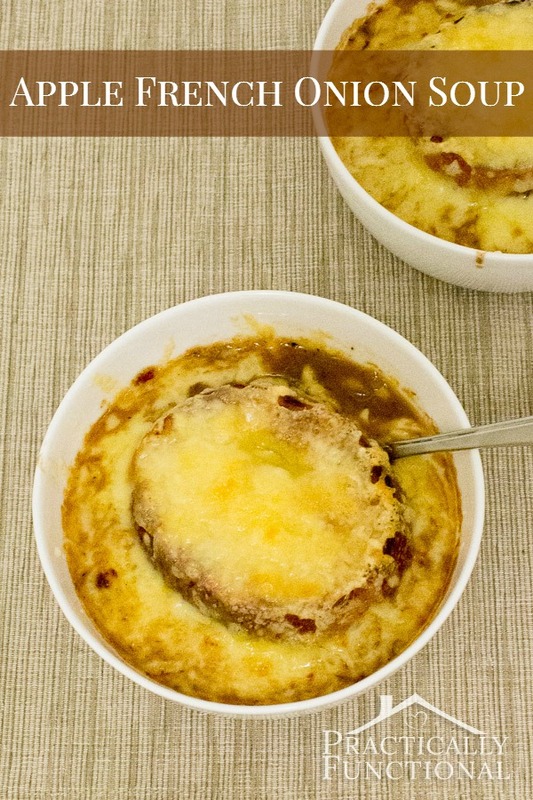 French Onion soup is one of my favorites and I love the addition of the apples and the apple cider, that sounds like it would give the soup great flavor! I’m all over this recipe! So perfect for Fall! I recently made French Onion Soup in a crock pot! 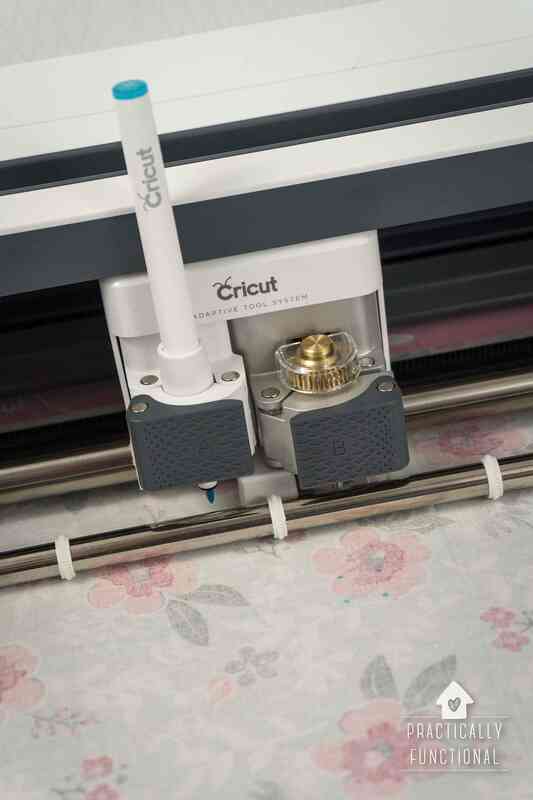 Yum … and easy!!!! Do you think this recipe could be adapted to a crock pot? Yep, I definitely think you could do it in a crock pot! It would probably still be a two step process (cook the onions first, then add the rest of the ingredients and let the whole thing cook a little while longer) but I bet you could do it! I must make this immediately! I would never have thought about adding apples to my French Onion soup. am so glad I found you through the WLOW #FallFavorites link hop! So glad you stopped by! And the apples really are delicious in the soup, definitely give it a try and let me know how it turns out! I LOVE this recipe, and it would be perfect for my new link party. 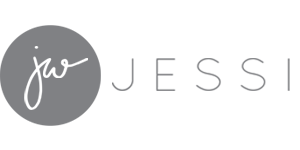 This link party is called ‘Required Ingredient Recipe Link Party’ and I’ll be holding it every Sunday, starting right now. The idea is to focus on a single ingredient each week and I’m starting off with cheese because everyone loves cheese! 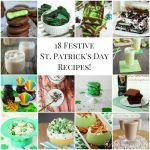 I’m planning to do a ton of promotion to get this link party off the ground, so any recipes you post should get lots of attention. Regardless of if you link up or not, I’m pinning this recipe! Yum! This looks delicious! And something I need to add to my menu plan. Thanks for sharing. Thanks for linking up at Romance on a dime! !